On Tuesday 7th March 2017, the Board of Directors are pleased to announce the appointment of Mr. Yuzo Kuboyama as Chief Marketing Officer of PT. DigitalInstincts Teknologi (DIT). Mr. Kuboyama is the Deputy Manager of ICT Department of Sojitz Corporation with years of experienced in IT industry. Over the course of his career, Mr. Kuboyama were exceptional in planning and implementing marketing strategy and emphasizing IT development to meet customer needs. 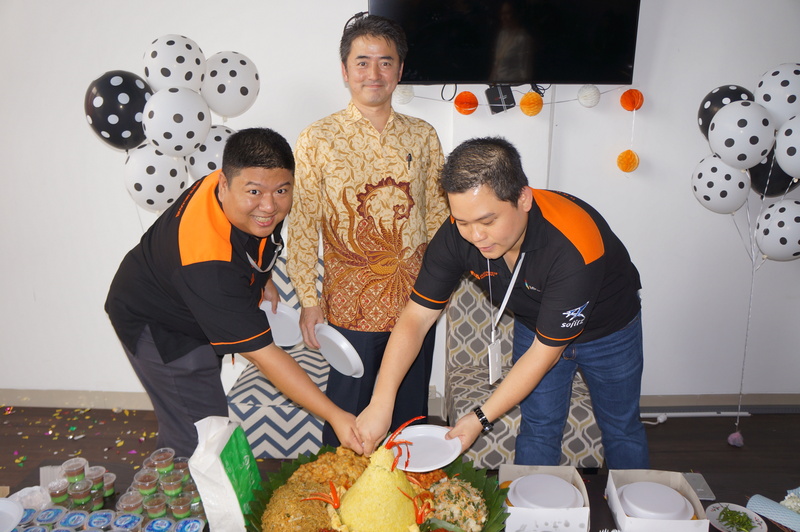 The welcome celebration aims to establish intimacy between Mr. Kuboyama and PT. DigitalInstincts Teknologi. Started with slide show containing profiles of Mr. Kuboyama and the whole DIT team. Continued with speeches from Board of Directors, Mr. Kenny Marchel as CTO and Mr. Steven Adriyanto as COO of DIT. Afterwards, brief introduction from each member of DIT and explanations of Key Performance Indicator (KPI) along with DIT’s Vision and Mission. We end the announcement with a traditional ceremony in Indonesia called “Potong Tumpeng” and a lunch meal altogether with DIT family. We hope this memorable moment will enhance collaborative partnership between DIT and Sojitz Corp to achieve our mutual goals.